We’re in a no-win situation when it comes to Trump—actually, multiple no-win situations, but for the purposes of this newswire, we’re going to focus on the inability to look away from the constitutional train wreck that is his presidency. We can’t ignore the flood of executive orders coming from the White House, or the war Trump’s waging against the press (one of several he’s hoping to initiate, probably). John Oliver’s similarly weary and yet required to at least keep tabs on the latest salvo against human rights in this country. But, as he told Stephen Colbert on The Late Show last night, we all have to keep resisting. 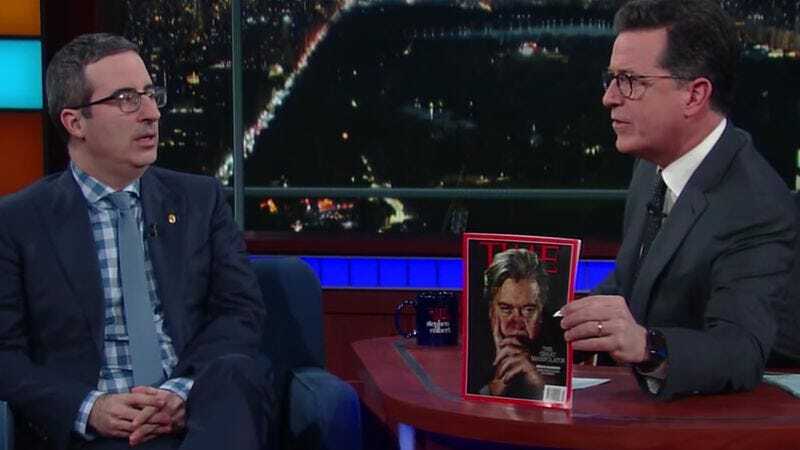 When asked about chief strategist Steve Bannon, all Oliver could say is that he’s a “terrifying individual.” The Last Week Tonight host signed off on the previous season by urging viewers not to let the Trump administration’s orders become the new normal. This was long before we were bombarded with so many questionable decrees, such as Trump’s attempts to scale back on Wall Street regulations. But Oliver and Colbert showed their sense of humor is still intact, joking that Betsy DeVos’ confirmation as Secretary Of Education should inspire junior high kids to run out and get Cabinet appointments—they’re equally qualified, after all.